I'm sorry my blog has been lacking in posts this week. What can I say? Life has been extra life-y lately. But I'm escaping to Chicago on Thursday for a mega-fun girls weekend! There are plans for sleep-overs, fun outings, and we're going to see Wicked on Sunday! I'm so excited! ...So there may not be much from me till next week. My apologies. Hope everyone has a wonderful three-day weekend! Did you know that one-third of American children enter kindergarten developmentally behind their peers and without the skills necessary to succeed at grade level? This is an issue of national concern, regardless of whether you're a parent of a child or not. That's why Jumpstart – a national nonprofit organization focused on intervening early in the lives of at-risk children, through intensive early education programs – has created a way for every adult and every child across the country to raise public awareness about the early education gap that exists between income levels. Jumpstart has begun a campaign to create the largest "shared reading experience" ever by breaking the record they set last August (2006) when 150,000 people read the same book across the country as part of Jumpstart’s Read for the Record inaugural campaign. Not only is this a campaign to raise awareness, last year, Jumpstart’s Read for the Record raised more than $500,000 to support the organization’s early education work in low-income communities. This year's book is The Story of Ferdinand, by Munro Leaf. You can be a part of the largest "shared reading experience" ever, while doing a great thing for the youth in America. Go here to learn more! Though Literacy Launchpad breaks for the summer, my Hooked On Phonics lessons do not. I offer Hooked On Phonics lessons at one school, and I have about seven children that I work with each week. I have only been using the Hooked On Phonics curriculum for about a year. I was hesitant to even begin offering it, but it seemed that there was interest among some parents. I encourage parents to enroll their children in both Literacy Launchpad and Hooked On Phonics, and not Hooked On Phonics alone. This is because I believe very strongly that children need to have fun with books, see the purposes of reading, and experience literature in meaningful ways in order to build a solid foundation for learning to read. I guess this all goes back to the phonics vs. whole language debate... I really do see value in the Hooked On Phonics program. I wouldn't use it if I didn't. Granted, the lessons aren't a ton of fun for me (at least not compared to Literacy Launchpad lessons), but the children do seem to enjoy them, and they do learn a lot. I guess I just wish there was more depth to the curriculum. What do you think? Anybody else familiar with the Hooked On Phonics curriculum? 30,000 what? Go check out this article at LiteracyNews.com to find out. Parents, go read it now! Thanks to Jen Robinson's Book Page for the link! I went to a baby shower about a week ago, and I gave my standard baby shower gift, which is The Read Aloud Handbook by Jim Trelease and a picture book. I almost always choose Tails by Matthew Van Fleet for the picture book. This is because Tails seems to be a hit with just about every little toddler (and younger)! It's filled with cute animals that have fun tails to play with! One of my nieces loved this book so much that she wore her copy of it out (thanks to my sister, Rebecca, for tipping me off to this book). I highly recommend this book for children ages 0-3 yrs! But back to the baby shower! I buy The Read Aloud Handbook for people because it is full of fascinating information, and every person should read it (in my opinion), especially if you're a parent or teacher. (Not familiar with the book? Find out more info about it here, and buy it here.) What gift could be better to a new parent than empowering them to read to their child from birth? A reading parent is infinitely more valuable (and often more practical) than most of your typical baby shower gifts. When giving this gift, I like to think of myself as a kind of fairy godmother (think Disney's Sleeping Beauty), but instead of giving the gift of beauty or song, I give the gift of reading... and they all lived happily ever after! In other news, I started putting up my bulletin boards and handing out flyers for classes today at some of my schools. 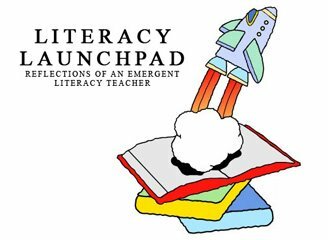 Literacy Launchpad classes start the second week in September, and I'm getting excited! If you're a parent visiting the blog for the first time, welcome!! Please visit regularly! Reading Rockets has posted a very interesting article on their site about how to effectively read-aloud to children (to enable them to learn the most). What I found most interesting in the article was that they encouraged reading sophisticated stories with young children, and not ONLY predictable stories and concept books. This is something I have always done, but sometimes second guessed myself on, wondering if I was presenting stories the children wouldn't understand (see some of my thoughts in yesterday's post). Usually my doubts are allayed when I see these "sophisticated stories" become some of the children's favorites, but it was nice to read some research that backed that up! As I mentioned last week, I have been hunting for new books to incorporate in this year's Literacy Launchpad curriculum. And by new, I mean new to my curriculum; not necessarily newly-released books. It's tough to do a thorough search for new books, because there is a pretty limited selection at both the library and bookstore (relatively speaking); they don't always have the books I'm looking for (or if they have it, it's not always in stock). And it's not always easy to get an accurate feel for a book at online bookstores and through reviews. So... I'm still searching, but I have found some I really like. I am dying to finally incorporate Leaf Man, by Lois Ehlert into my lessons. This will be tricky because I love all my books that I am currently using during that fall, and I will have to bump one to use this book. I like this book enough to do that though! Tippy-tippy-tippy, Hide!, by Candace Fleming is a fantastic book. I had so much fun reading this one, and I know this will end up being a favorite of my students. I'll probably wait till the end of winter to use it. It's going to be hard to wait! I'm still searching! Have any suggestions? Leave them in my comments! So the Cheekwood Scarecrows thing is definitely a GO! I am registered and set to pick up the supplies for the basic structure of the scarecorw later this week. But I'm a little freaked out about it, because I have no solid idea about how I'm going to make this scarecrow. I want it to be something unique and creative (obviously); I want it to tie in with reading and/or literacy; and I would like the children to be able to participate in creating the scarecrow on some level. So... if you have any brilliant suggestions, please leave them in the comment section. Meanwhile, I will be reading some scarecrow-making books and brainstorming some more! A new picture book blog was brought to my attention by Big A, liitle a. As the old saying goes, "A picture is worth a thousand words... and weighs significantly less." I love reading as much as the next person, but there are only so many hours in the day. For example, why spend weeks (or months) reading David Foster Wallace's indulgently long Infinite Jest when you could spend minutes reading Crockett Johnson's Harold and the Purple Crayon which is basically the same story? (minus the prescription drug addiction.) It's really just a matter of efficient time management. Efficient time management... hmm... This will be a good point to bring up with my husband. He believes watching the movie adaptation of a novel is efficient time management. Imagine how much more he could be getting done in a day with the help of picture books! I endured many mockings from my older siblings for watching Pinwheel, but it was worth it! It amazes me how ancient this cartoon looks, though. Anybody agree with my here? I'm not very old, geesh! Anybody else a fan of Pinwheel growing up? Or please feel free to share thoughts on your own childhood cartoon favorite. Today's Special was also a favorite of mine, though not entirely a cartoon. Anyhow, read here for Fuse #8's blog posting about Pinwheel. You scored as Elizabeth Bennet, You are ELIZABETH BENNET from Pride and Prejudice. Few people find you disagreeable. You are often described as intelligent, clever, and quite worth looking at. You are the best of company, though your family may not be. I'm back from my trip to Chicago to meet my new niece. She's so little, and so sweet. It was a great trip. One of the highlights from my trip, other than meeting my new niece, was taking my other niece (3 yrs. old) to the library. Since I don't have children of my own yet, it was especially fun to go with my niece and show her some of my favorite stories. We tried going to the library on Friday, but they were already closed when we got there. So we came back on Saturday. My niece started out at the computer, then moved on to the puzzles, and then we started reading some books. First I pulled out a a big book version of Mrs. McNosh Hangs Up Her Wash. My niece laughed at all the good parts. Then I found Not A Box, and she loved that one too. I suggested to her how fun it would be if we had a box that we could play pretend with, and as soon as we got home she asked my mom for a box! Luckily my mom had one, and she climbed right inside and pretended it was a car. How cute is that? After she had let me choose a few books, my niece went hunting for books on the shelf by herself. She came back with a Caillou book and a Barney book, and so we read those too. The library closed an hour after we got there, so we didn't have a long time to read, but we still had fun. Ten minutes before they closed my niece found a big book version of The Tiny Seed. We had to read it fast, but it was a great finish to the trip! Neither of us had a library card for this particular library we visited, so we couldn't check any books out. We put our books away and headed out to our car. My niece stopped me once we got outside. She remembered seeing the "closed" sign the day before, and so she wanted to know what the various signs outside the library said. I pointed out the "open" sign to her and explained that they would flip it to say "closed" when they locked the library doors for the night. She wanted to stay and watch them do that, and so we did. We got some strange looks from all the people leaving the library though, as we sat there intently looking at the "open" sign. I love that my niece is so fascinated with words. She definitely understands that words have meaning, and is curious to learn what their meaning is. She will ask you to read any and all kinds of signs to her. It's great! She's going to be reading before we know it!